Indian Prime Minister Narendra Modi and his Bangladeshi counterpart Sheikh Hasina share a laugh after signing multiple agreements, New Delhi, India, April 8, 2017 (AP photo). Earlier this month, India’s new foreign secretary, Vijay Kashev Gokhale, visited neighboring Bangladesh for meetings on issues ranging from Rohingya refugees to the sharing of water supplies. New Delhi and Dhaka also signed a memorandum of understanding to build an 80-mile oil pipeline that would allow oil to be exported to Bangladesh. 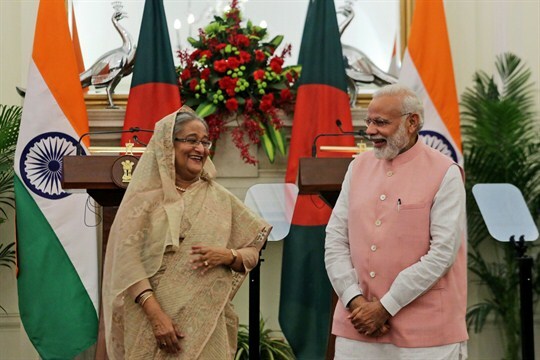 India’s efforts to deepen ties with Bangladesh are part of Prime Minister Narendra Modi’s ambitious “neighborhood first” foreign policy initiative. In an email interview, Michael Kugelman, the deputy director of the Asia Program and senior associate for South Asia at the Woodrow Wilson International Center for Scholars, discusses the state of Indian-Bangladeshi relations, how they fit into Modi’s regional agenda, and why China is “the key obstacle” to strengthening ties.